The Diocesan International Virgen de GraciaSchool encourage very strongly its students to study foreign languages as a tool to learn new cultures and communicate. For over 10 years we conduct international agreements with other foreign colleges and universities that enrich our educational environment. In 2012 Virgen de GraciaSchool becameofficially a bilingual school being the main foreign language English to learn and used to teach different subjects. However this is not the only language our students can learn here. For further information on languages click here. We offer our students and families a wide program of stays abroad in different countries: United States, United Kingdom, France, Germany and Ireland. 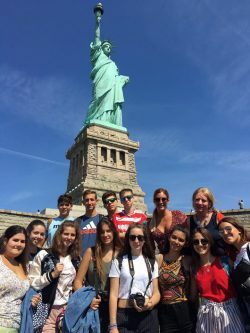 Thanks to our international agreements, our School of Granada take on all year long students from different universities in the USA and Europe to do their teacher training. They are future teachers who help us to complete our commitment to teach and motivateour students to learn foreign languages in all educational stages.